Here is a list of books that I have on my bookshelf. The links will take you to Amazon. I’m an affiliate, which means when you make a purchase, I get a little kick back. Know that this helps to support my work here at 100mandalas.com and I use the credits to further my study of mandalas and to purchase art supplies. I keep giving back as I share with you what I learn. 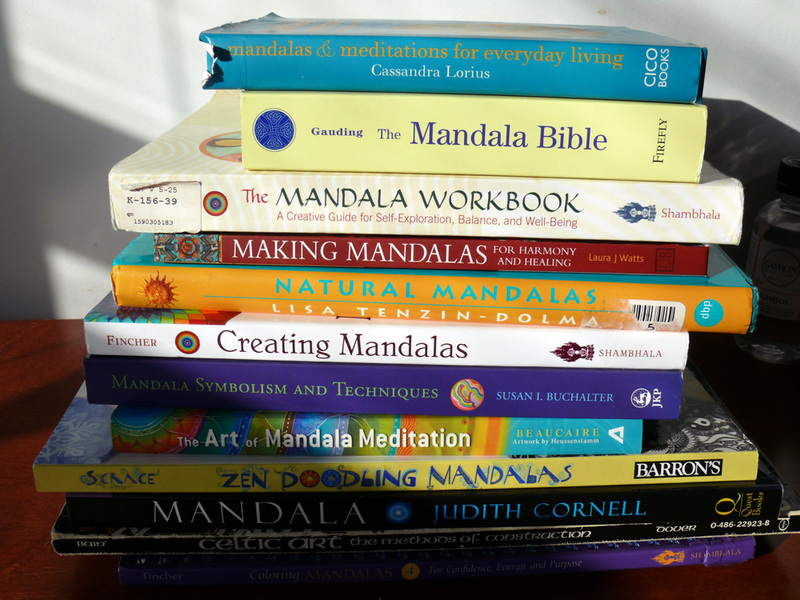 There are many other books on mandalas, but these are some of the ones that I have on my bookshelf. Happy browsing! The Mandala Healing Kit: Using Sacred Symbols for Spiritual and Emotional Healing by Judith Cornell, Ph.D.
Mandala: Luminous Symbols for Healing, 10th Anniversary Edition with a New CD of Meditations and Exercises by Judith Cornell, PH.D. There are many more coloring books on mandalas. I only have a few as I tend to draw my own mandalas or color the mandala art from our own coloring books that are free to download. The books listed here are not easy reads and only touch the surface of the topics. They are all beautifully illustrated. I rate these books 1 or 2 stars.